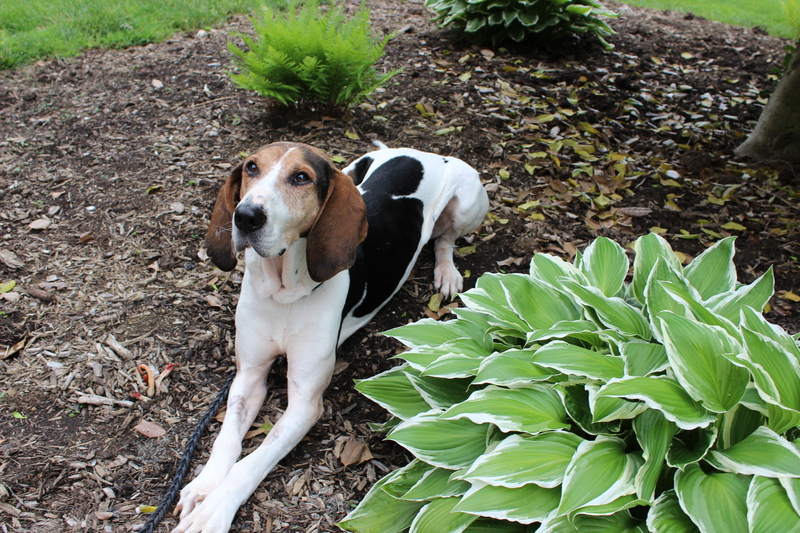 Therapy dogs coming to the rescue at the VNA Philadelphia Hospice. Doggie dearth. Canine decline. Whatever you call it, the patients at the VNA Philadelphia Hospice (VNAPH) haven’t seen a cheerful pup since 2016. Back then Stella, an intuitive, sweet Doberman mix, and Ni-Chin, a Japanese Chin, who often wore costumes and rode in a Santa sleigh during the holidays, used to go room to room in the 15-bed inpatient unit, bringing smiles to the patients and the staff. The halls haven’t been the same since and, even with all the progressive therapies at VNAPH’s disposal, it turns out it’s impossible to replace a furry greeting. Thankfully, the wait is almost over and yelp is on the way. 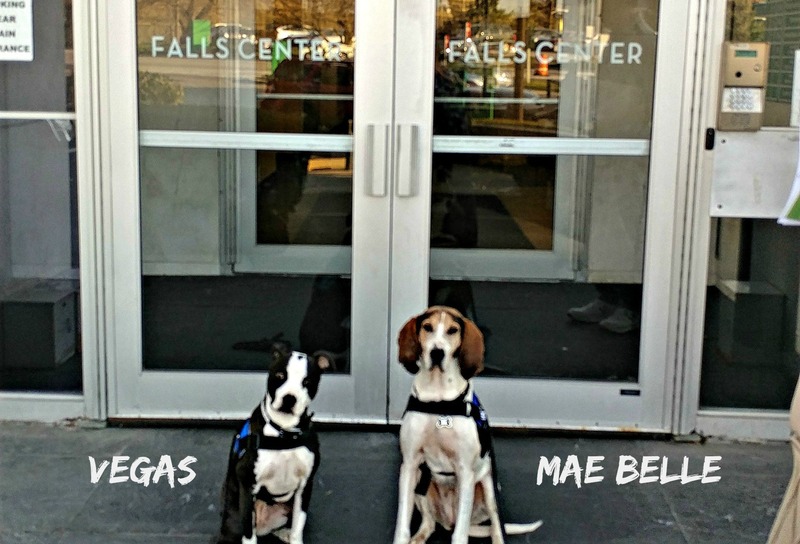 Vegas, a pitbull mix, and Mae Belle, a Treeing Walker Coonhound, visited VNAPH earlier this month with Alicia and Gene Harantschuk of Comfort Caring Canines to volunteer their services. 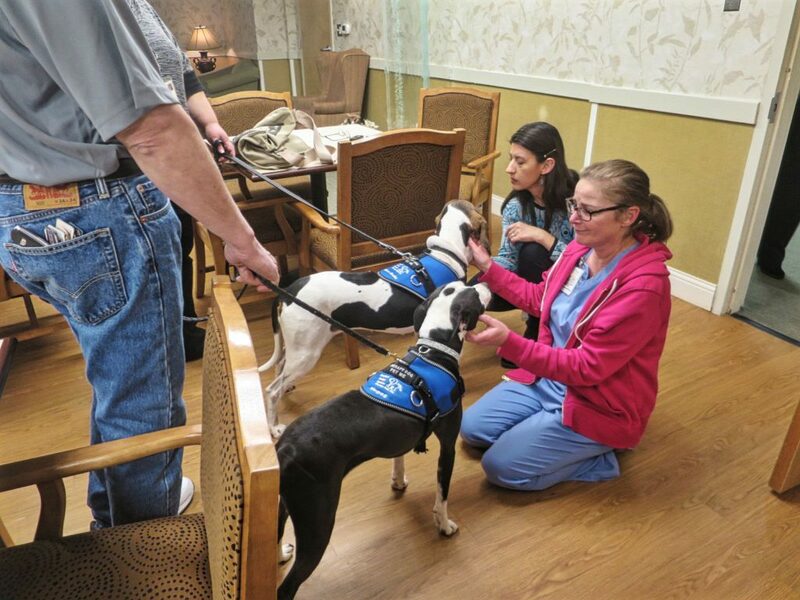 The pups hadn’t been in the building two minutes before staff members began popping up from their desks and queueing up in the hallway outside the office of Terry Scott, the Manager of the Volunteer program at VNAPH. Fortunately, Vegas and Mae Belle are pros. Vegas, with over 250 visits under his collar, is the more experienced of the two (Mae Belle’s had “only” 75 visits) but Mae Belle is more serene. “She’s very gentle” says Alicia, “she’ll hop right up on a couch next to a patient and lie there all day.” “Almost like a greyhound,” adds Gene. Both dogs are veterans of everything from nursing homes to college campuses (“de-stressing” sessions for test weary students), to kids’ reading classes (turns out dogs love to hear people’s voices and aren’t sticklers for grammar, which helps kids read aloud with confidence). 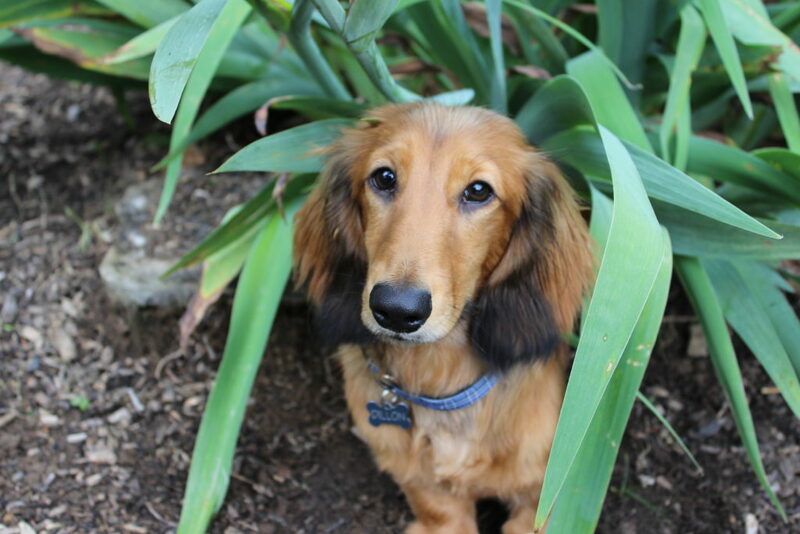 Interested in therapy dog training? If you’d like to enroll your promising pup, contact Alicia at Comfort Caring Canines (ccc@comfortcaringcanines.org) or Leigh Siegfried at Opportunity Barks (888-672-2757 or leigh@opbarks.com). 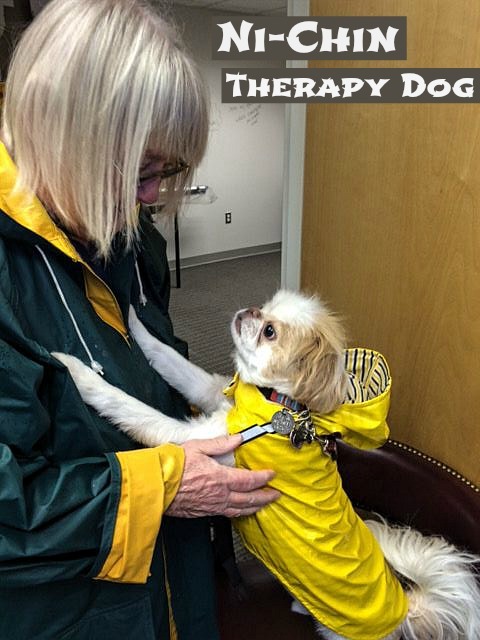 If you already have a therapy dog, consider becoming a volunteer at the VNAPH. Shifts are flexible and the gratitude from patients and caregivers runs deep. Contact Terry Scott at 215-581-2360 or tscott (at) vnaphilly.org for enrollment info. Alicia, Gene, and the team have completed the training course and will be visiting the inpatient unit at VNAPH in a few weeks. 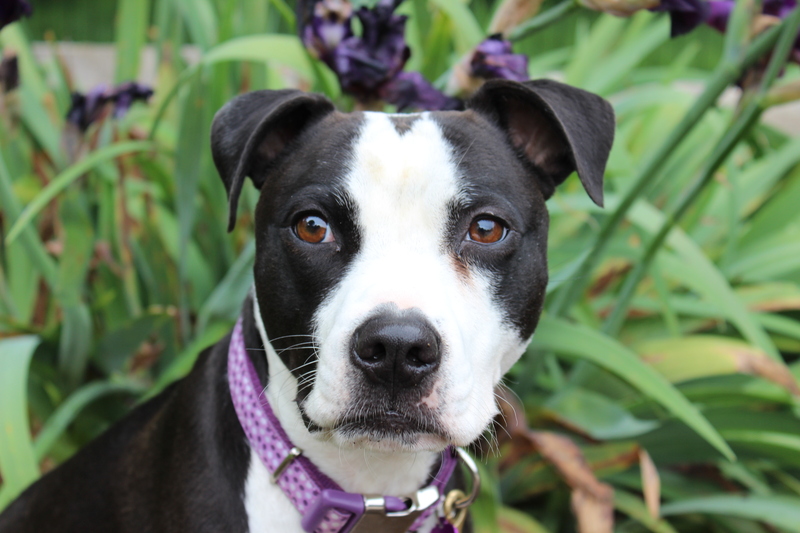 BONUS, they’ve found another volunteer to join Vegas and Mae Belle. Ladies and Gentlemen, here’s Dillon.